Benedict XI, given name Niccolo Boccasini, Roman Catholic Pope from 1303 to 1304, the son of a notary, was born in 1240 at Treviso. Entering the Dominican order in 1254, he became lector, prior of the convent, provincial of his order in Lombardy, and in 1296 its general. In 1298 he was created cardinal priest of Santa Sabina, and in 1300 cardinal bishop of Ostia and Velletri. In 1302 he was papal legate in Hungary. 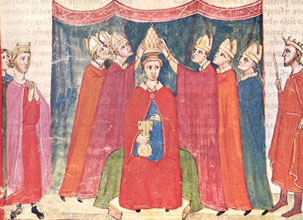 On the 22nd of October 1303 he was unanimously elected pope. He did much to conciliate the enemies made by his predecessor Boniface VIII, notably France, the Colonnas and King Frederick II of Sicily; nevertheless on the 7th of June 1304 he excommunicated William of Nogaret and all the Italians who had captured Boniface in Anagni. Benedict died at Perugia on the 7th of July 1304; if he was really poisoned, as report had it, suspicion would fall primarily on Nogaret. His successor Pope Clement V transferred the papal residence to Avignon. Among Benedict's works are commentaries on part of the Psalms and on the Gospel of Matthew. His beatification took place in 1736.